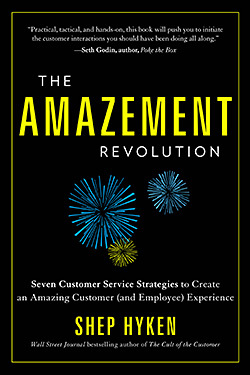 In an excerpt from his new book The Amazement Revolution, author Shep Hyken explores how AmEx uses its membership structure to energize customers. American Express doesn’t have customers or users or clients. American Express has members. Every single holder of an American Express card is a “cardmember.” Many of those members can quickly tell you, without even looking at the date on their card, exactly how long they’ve been a member. And the entire organization is oriented toward communicating with, engaging, and serving those members. The specific concept of membership began in 1963, when American Express first began embossing those “member since” dates on their charge cards. The larger idea of defining a premium level of experience, one reserved exclusively for people who choose to work with American Express, really does have its roots in a premium-service ethic. “We’re here to help,” Bush told me. “That goes back to the start.” That ethic has been part of the organization’s legacy, and its chief competitive advantage, since the company’s founding in 1850. The American Express Company began life as an elite express shipping service. Back then, its role and mission was to “Forward Merchandise and Money, Collectibles with Goods, Notes, and Drafts, throughout the State of New-York, the Canadas, and all the Western States and Territories…Each Express in charge of a Special Messenger.” The service-driven company prospered–and innovated. In the 1880s it offered its mobile, worldly, generally upscale clients a revolutionary new solution to the frustrating personal challenge of not being able to make purchases easily while overseas: the traveler’s cheque. The rest, as they say, is history. In recent years, CEO Kenneth Chenault has reinvigorated the brand by inspiring a new generation of true believers to live up to American Express’s lofty history–and its tradition of high service standards. Bush is one of those true believers. He proved that much during our conversation by returning over and over again to three critical themes that support the central service concept of membership as it is lived out every day at American Express. “By putting that ‘member since’ date on our cards,” Bush told me, “we create membership, and membership is something that our cardmembers treat as a badge of honor. It’s not elitist. It’s inclusive. It means they are appreciated, that they have the right, and expect, to be served in a premium fashion. As long as we treat them like members in high regard, we believe cardmembers will maintain their relationship with American Express. Our job is to continue to service the needs of all our customers who rely on us as a premium service experience organization. Those rewards include access to fine dining through some of the company’s premium card offerings, the ability to get tickets for exclusive theater engagements, and access to airport clubs for frequent travelers. Hundreds of other such amenities are tangible benefits of membership. And the sheer range of benefits American Express offers day after day, around the world has been impossible for other players in the credit card industry to duplicate. The right amenities can take the membership experience to another level, one that makes your enterprise unique. Jim Bush repeatedly emphasized one point during our interview: American Express sees delivering premium service to its cardmembers not as an expense but as a critical strategic asset, one that pays back handsomely in both the immediate future and the long run. Accordingly, the company welcomes opportunities to invest in improvements in the quality of its membership experience. No, this isn’t just talk. When it comes to investing in the membership experience, Bush and his leadership team have been instrumental in making absolutely sure that American Express puts its money where its mouth is. Excerpted from The Amazement Revolution by Shep Hyken. Hyken, is the Chief Amazement Officer (CAO) of Shepard Presentations, LLC. As a customer service speaker and author, Shep helps companies build loyal relationships with their customers and employees by helping them deliver amazing levels of customer service. He is the author of the Wall Street Journal best-selling book The Cult of the Customer and the creator of The Customer Focus customer service training program. For more information, contact Shep Hyken at (314) 692-2200 or shep@hyken.com.